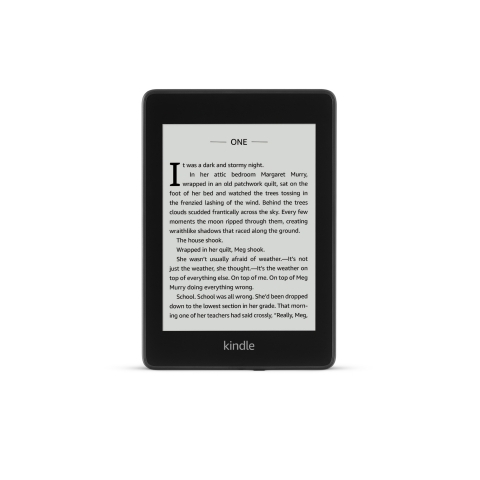 SEATTLE--(BUSINESS WIRE)--Oct. 16, 2018-- (NASDAQ: AMZN)— Today, Amazon introduced the all-new reimagined Kindle Paperwhite, featuring a thinner and lighter design, sleek flush-front display, and waterproofing so you can read comfortably anywhere. It also comes with Audible so you can switch seamlessly between reading and listening to professionally narrated performances from the world’s largest selection of audiobooks. For a limited time, you get six months of Kindle Unlimited for free, a $60 value, so you can read as much as you want from a selection of millions of titles. And with so much great content, the all-new Kindle Paperwhite comes with twice the storage so you can hold more large files like audiobooks, magazines, newspapers, and comics. The all-new Kindle Paperwhite still includes features customers love about Kindle like a glare-free display and a battery life measured in weeks. The all-new Kindle Paperwhite is available for pre-order today for just $129.99 at www.amazon.com/kindlepaperwhite and will start shipping November 7.